Is it true that every person who claims to be a Christian truly is one? There are some estimates that there are about 33,000 religious organizations under the name of “Christianity.” There are no “hyphenated” Christians or adjectives or other names that need to be added to explain what kind of “Christian” you are. If I claim to be a Christian, how can that be true if I do not follow the teachings of Christ or honor His Word? Just because someone claims to be a Christian does not mean they meet the standards as set out in the Bible. 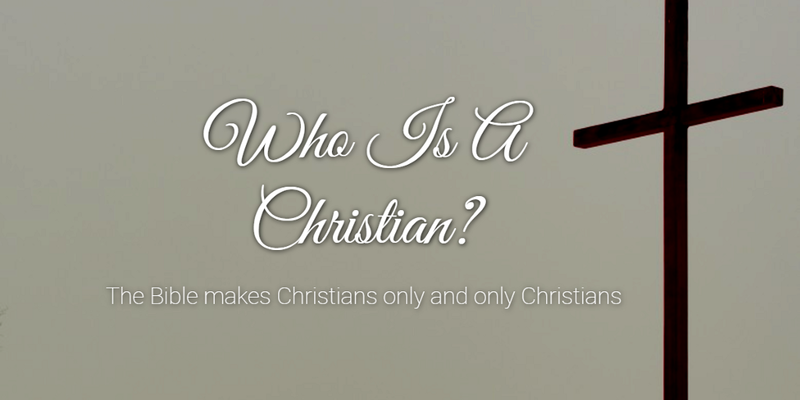 Who is a Christian? John 12:42 — many people believed in Jesus as the Christ but they wouldn’t confess Him because they were afraid to lose their place in society. James 2:19 — demons also believe and tremble. Can we say they are Christians? They recognize God and know Him for who He is but they refuse to live in compliance with His will. Just a good, moral person. Cornelius feared God, prayed always and gave (Acts 10:1) but it took a visit from Peter to teach him what he needed to do to be saved (Acts 11:14). Just any religious person. There are plenty of religious people who do not believe in Christ. Paul was in the midst of a group of people in Athens who were highly religious (Acts 17:18–23) but they did not know God. Someone who follows the Old Law. The whole Bible is the inspired Word of God, including the Old Testament that has been fulfilled. When Jesus came, fulfilled the Law and instituted a New Testament, He took away the Old Law (Colossians 2:11–14). Paul taught the Galatians that the Old Law had served its purpose to bring about the New Law (Galatians 3:24). Has obeyed the Gospel (Romans 1:16). Heard the truth (Romans 10:17). Has believed (Matthew 7:24–25, John 8:24, Hebrews 11:6). Believing means doing. Has repented (Acts 17:30, Acts 3:19). This means turning away from your sin and living a changed life. Has confessed Jesus is the Son of God (Matthew 10:32–33, Romans 10:10). Has been Biblically baptized (Acts 2:38, Acts 22:16, Romans 6:3–4). In every example of conversion we find in the book of Acts, we find baptism. Lives under a new standard (Hebrews 4:15–16). Is part of “the vine” and lives in Christ (John 15:5–6). A member of the One Body (1 Corinthians 12:12–13, Ephesians 4:4). A citizen in the Kingdom of God (Colossians 1:13–14, John 4:1–3). The Bible makes Christians only and only Christians. To become one, you must do what the Bible says and that’s not always easy. Sometimes it means that friends and family will not accept us. But God tells us that He is the standard and that those who disregard that standard will not enter into the rest He has prepared for the Christian. Be a real Christian because you have read and followed your Bible. Based on a lesson by Robert Moss.